It’s raining – luckily the hotel staff gave me an umbrella to use. Navigating the streets in Chengdu is a little maddening. One wrong turn and you can’t fix it – you have to retrace to the beginning. I found the Church of the Immaculate Conception by following my photo of Google maps – later I would realize the second metro exit lets out literally a block away, and I had just spent twenty minutes of damp walking for nothing but the exercise. Weather cannot dampen the call. I didn’t think mass would have begun, but it had. I arrived just in time for the First Reading – an adorable child read it in Chinese, and then again in English. The church was full – ushers in red sashes kept the crowd at the doors, and I joined them. There was constant shuffling, and children running in and out, but it was not too packed. I stood in the doorway, trying to be reflective. It’s difficult when you’re not entirely in the church to focus on the sermon, doubly so when the sermon is in Chinese only. I start looking about, at the painted windows. I realize that many of the angels have blond hair and Asian features. I can’t figure out why they didn’t just make the angels Chinese and give them black hair. Christian and Caucasian go hand in hand? There is a lot more singing in this mass – and I can’t tell if people are singing the mass responses or songs. I do recognize giving the sign of peace – everyone starts bowing to everyone else, palms pressed together. Only one old man grabs my hands in his. I notice an old woman enter the crowd, willing herself through people. At the start of the pews, just before the rope, she genuflects. Her umbrella is slippery on the marble floor, and it’s clear her legs are not good. She’s too far away from me, but I don’t understand why no one helps her. Everyone just watches her almost topple over, make the sign of the cross, and then painfully clamber to her feet again. I can’t tell if it’s cultural or just plain old willful ignorance, pretending like you don’t see someone who clearly needs help (like we do with the beggars and street urchins). The Eucharist takes a little while. Not only is the church full, but I’ve found that queuing is simply not a skill here in China. The gaggle in the back, of which I am included, surges towards the red rope. I recognize people from the side doors as they shove themselves forward. Like there might not be enough Body of Christ for everyone, and everyone wants to be the first of the last. Then, at the end, they all sing “Jesus Christ is Risen Today,” in Chinese, just like at home. I’ve sung this song so many times, I know most of the words by heart. So I just start singing in English – the “Hallelujah!” translates, so we all sync up then – Chinese and English, all singing that one Latin word. We all rejoice together. Outside the church, I found the Sunday school. The church itself is done as a Western church, with arches and candelabras and pews. But the school, and the informal compound attached to the church, are modeled as an Eastern temple. Pagoda like structures and tiled roofs create courtyards and quiet spaces. I like the mix – I believe that faiths and architecture are two things we should try to blend more often. I hadn’t intended on going to mass. My thought had been to stop by, say a prayer for my family, and leave. It’s in the quiet holy spaces that I work harder to rediscover/locate my faith. When there are people, I am more aware of them than myself, and I let myself get distracted. Still, I have not been to mass in some time, and it’s nice to participate in the patterns of Catholicism. The rest of the day was getting back to the hotel, taking a nap, and pretending like I didn’t have to leave. I really wish I could have stayed another day or two – being able to relax and just look out a really high window. It was exactly what I wanted – another day and I would have actually done some writing. I really need to do some writing…. 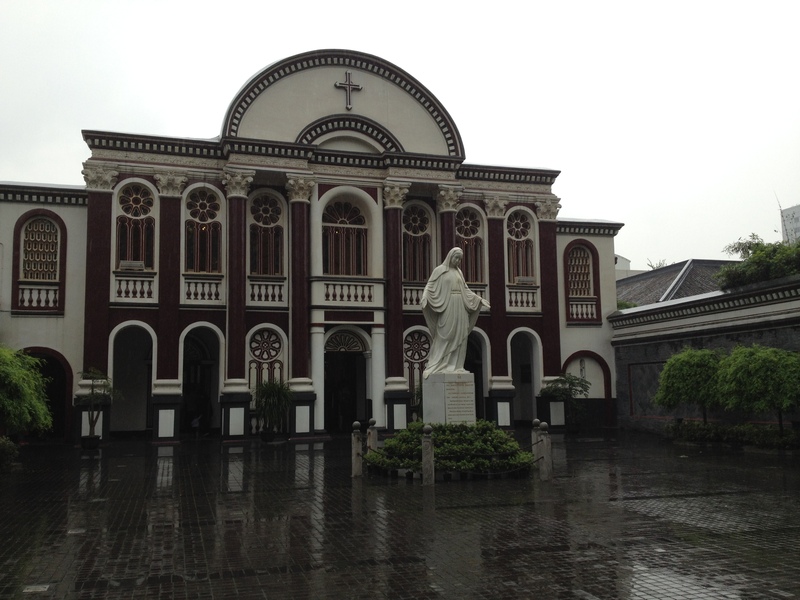 This Post was posted in Observations, Places, Reflections and tagged Catholicism in China, Chengdu, Easter abroad, Faith, Hallelujah. Bookmark the permalink.